The choice of cities is quirky. The obvious world capitals are there but we also find, for example, Andorra la Vella (with a very retro feel and a banning of nanotechnology). Inevitably the urge is strong to pick out the cities in your country first. For the UK we get the fairly obvious London and Birmingham, combined with Bristol, Oxford, Plymouth and Wolverhampton. Inevitably, also, the first response is 'Why these? Where's Cambridge and Manchester? What happened outside of England?' but in the end, the choice is the author's. The range of environmental futures awarded the cities is impressive - and like all good utopia stories, there are some darker reflections. Paris, for example, is portrayed with the Eiffel Tower collapsing as the remains of a space elevator collapses from the sky (Marshall doesn't like space travel) and Palo Alto (is that really a city?) is a monstrous hi-tech future environment. Many, though seem impossibly wonderful. Marshall's cities seem largely redesigned from the ground up - yet history suggests that this rarely happens, with evolutionary change more likely than revolutionary. All in all, like most books where you get 100 anything, it's difficult to read from end to end - it's more of a dip in book. 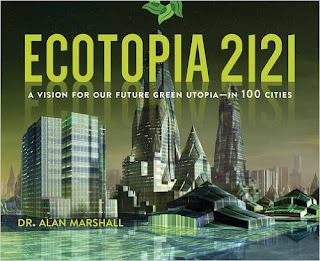 There are some interesting environmental ideas here - for example, the Bristol entry concentrates on a tidal barrier to Cardiff, which is wide enough to be a very narrow city in its own right - and I think the future cities will also prove a rich source of settings for science fiction writers. There's not a lot of science here, so I can't score it more than three stars - but at the very least it's a book that's worth taking a look at for its imaginative vision of a very unlikely but inspiring set of future possibilities. It is available on Kindle, but I'd go for the hardback to get a better feel for those illustrations.